Many years ago I had partial ingrown nail removed on both sides of right big toe. The inside always had a puffy pink spot that was sensitive to touch or pressure. Pedicures were murder to sit through. First podiatrist said nerve damage from old procedure and recommended capcasin. No change. Second podiatrist said maybe it needed more nail removed, something may be going on under skin. I agreed. He did find a pocket of irritated skin, removed that and a bit more nail. I am 4 weeks past the procedure. The sensitive spot is now where the procedure was done, so spot changed. See pictures. Where pen is pointing is where intense pain is. Simplest preasure and it is awful. Sometimes wearing my Brooks is uncomfortable depending on socks. Not sure what to do now? The first thing I would need to know is whether or not your doctor placed a chemical in the back portion of the nail to "kill" the root of the nail. This would be done to prevent the piece of nail he removed from growing back. If that is the case, then one of two things are going on. If a chemical was applied, generally phenol is used, then you may have a reaction to the chemical which is not uncommon and can be mistaken for an infection. The area may also be infected as well. 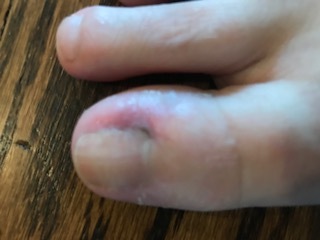 nail was removed then it appears the toe is mildly infected. This can happen for a couple of reasons. Sometimes, particularly, if the side of the nail was infected and draining, the drainage dries out and becomes hard and irritates the side of the nail causing pain and redness, such as is the case here. Additionally, at times if the section of nail that was removed is not smooth and there is rough spots along the side of the remaining nail, then the rough areas can dig into the adjacent flesh and cause issues as well. In any event, after four weeks your ingrown nail should have been healed and obviously it is not, so a trip back to your podiatrist is indicated. You never want to walk around with a toe in this condition. Aside from the obvious discomfort, a soft tissue infection in the toe, at times, can invade the adjacent bone and cause a bone infection which becomes a much more serious problem. 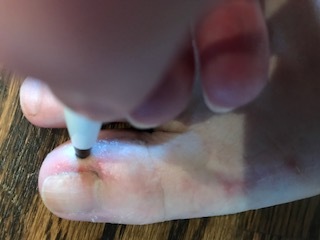 Although I obviously cannot examine you, in most cases the treatment is simply nothing more then cleaning out any dead tissue that may be blocking the side of the nail, in order to remove the irritation (pain) and to allow for any further drainage, if there is still some going on. This is a quick treatment and generally does not require anesthetic. So...make an appointment with your doctor and get this thing fixed.